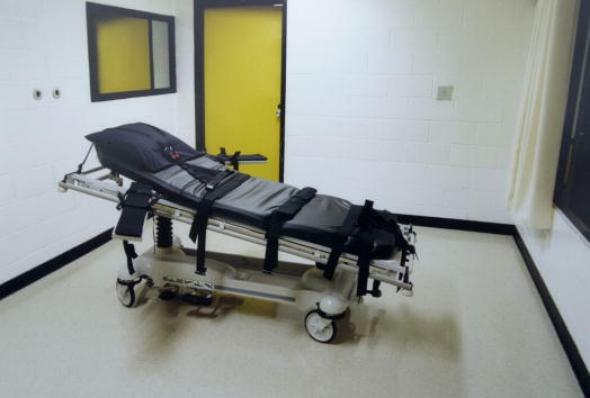 Lethal injection in the U.S. is a farce. The execution chamber at the Georgia Diagnostic Prison in Jackson, Georgia. Most informed American citizens are probably familiar with the moral arguments for and against the death penalty. Many are likely aware of the practical fact that some individuals found guilty of capital crimes by our justice system are later exonerated. If you follow the Supreme Court, you also might know that there is ongoing conflict over whether lethal injection is an inherently cruel and unusual punishment. But a story that broke today in Arizona reminds us that there’s another angle of the death penalty issue that’s underdiscussed, which is that on an administrative level—separate from abstract arguments about morality and justice and even from broader practical concerns about the justice system—the United States’ system of carrying out executions is characterized by farcical, embarrassing incompetence and thoughtlessness. In April 2014 Oklahoma officials attempting to execute an inmate took 51 minutes to find a suitable vein and still ended up pumping drugs into his tissue rather than his bloodstream, which resulted in a prolonged and chaotic death process in which the inmate actually died after the state had issued orders to stop the execution. In January 2015 Oklahoma officials used the wrong drug to kill an inmate, injecting him with potassium acetate rather than the potassium chloride that is called for in the state’s execution protocol. State officials didn’t realize their mistake (or at least didn’t admit it publicly) until October. The wrong drug! In June 2015 Nebraska officials’ efforts to import lethal injection drugs from India were rejected by the Food and Drug Administration. In July 2015 Arizona officials tried to buy a lethal injection drug from a supplier that was not approved by the FDA, forcing federal agents to step in and physically seize $27,000 of unapproved drugs at the Phoenix airport before they could get to the state’s department of corrections. What kind of slap-dash crap is this for a process that ends with the government killing someone? Looking across all these examples, a clear picture emerges. Pharmacists and doctors are hesitant to participate in the lethal injection process; officials nonetheless insist that executions will proceed, and they are generally bound by statute to use lethal injection to carry them out. But the people administering the executions often don’t know what they are doing, and there are increasingly few legal methods to obtain the necessary drugs. The result is the government’s most grave responsibility being improvised in the manner of a MacGyver episode if MacGyver were an idiot. And it’s a disgrace.